Specificity/Sensitivity : HBcAg core antigen. Produced against recombinant HBcAg core antigen (ayw). Reacts with synthetic HBcpeptides. 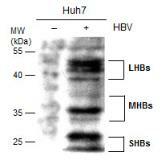 Specificity/Sensitivity : This antibody is not capable of immunoprecipitating HBx complexed with HBx interacting protein (XIP). Specificity/Sensitivity : Hmg/ml BSAg pre-S2 antigen (a.a. 132-137) (adw nomenclature). Reference start codon was Pre-S1. Epitoperecognition confirmed by competing with peptides. Specificity/Sensitivity : HBcAg core antigen. Produced against recombinant HBcAg core antigen (ayw). Reacts with syntheticHBc peptides.